Thank you so much for taking the time to view our registry. Your gifts are very much appreciate. If you see an item you would like to purchase but may get it at a different price, please reserve so others know it's no longer an option. 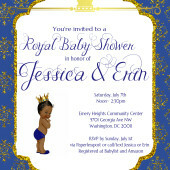 If you are unable to attend the baby shower, you may drop off your gift directly to us or have it delivered to the address listed which is The Fullers (grandparents) residence. Also, please view our registry on Amazon.com. Again thank you all and we cannot wait to see you all!